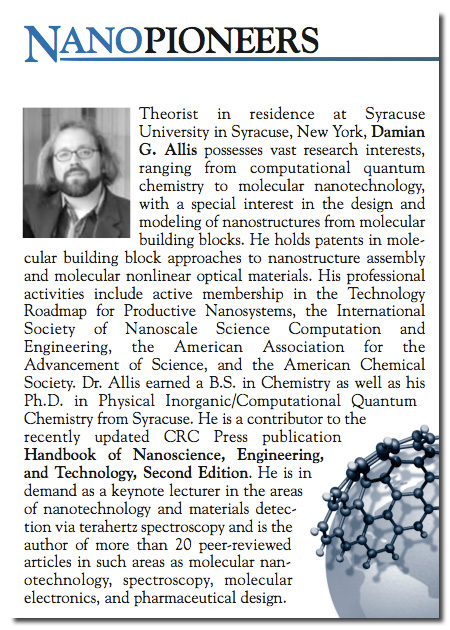 From the “It’s my blog and I’ll post if I want to” department, a little bit of free press and kind words came my way a few days back from Kacey Williams of the Taylor & Francis Group/CRC Press in the form of the most recent issue of NANONEWS, the monthly newsletter at nanoscienceworks.org. In case you’ve not been paying attention, the nanoscienceworks.org website recently went very 2.0 in appearance and organization, providing a excellent source of nano-related news from a hard-science perspective (a community-based Eureka Alert as it were). My CV‘s undergone some much-needed settlement since the bio for the newsletter was provided to the website, but all the science still holds, which is just as it should be. I recommend signing up for the newsletters directly and checking out the rest of the site, as there’s plenty of useful info to be had. 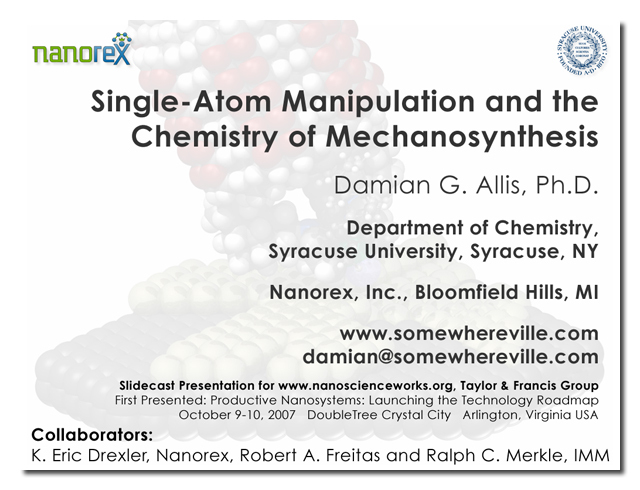 And speaking of content, this post also gives me yet another chance to link to the mechanosynthesis slidecast I put together for nanoscienceworks.org from my talk at the release of the Technology Roadmap for Productive Nanosystems last October. We spend all that time making slides and figuring out what to say, then the original content disappears as the research morphs. I very much like the slidecast idea, as (a) you can make a snapshot of your work to date and (b) you can direct people to you presenting your own work. Do consider putting your own together. The nanoscienceworks group is very accommodating and happy to help you through it.